A team of scientists spent 2.5 years traveling the oceans, over 70,000 miles, and came back with a startling discovery. There was once thought to be 30,000 species of plankton but they discovered more than 2 million species. The diversity, and strangeness, is astounding. One species combines together to form a chain 40 meters long while another forms symbiotic colonies, living within each other. Learn more about the Tara Expédition by visiting their website, listening to PRI’s interview, or following them on Facebook. The northeastern Pacific Ocean population of great whites is genetically distinct and in danger of extinction, according to the petition. Researchers have estimated that there are about 340 individuals in the group that are mature or nearly so. “There could be fewer than 100 breeding females left,” said Geoff Shester, the California program director of Oceana, an international group focused on protecting the world’s oceans. Wow, just a few hundred of these guys out there. Even though the ocean is a huge place, that small number would probably still inspire enormous fear in people, despite the extreme rarity of shark attacks. 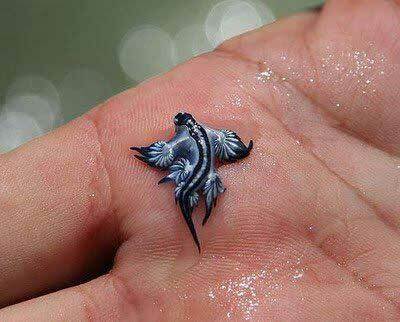 This little guy is called Glaucus Atlanticus. It is a species of sea slug that grows to around 35 mm. They float partially by means of an air bubble, which they swallow and store in their gastric cavity. They also have a rather unique defence mechanism – they store the nematocysts produced by jellyfish (their prey) in their own tissues to protect against predators. Find more awesome creatures on the Facebook page – I F***ing Love Science – and see the last amazing species, the carnivorous plant. Scientists from the federal fisheries lab in La Jolla have reported a serious decline of white abalone along the San Diego coastline, confirming some of the worst fears about the species as it slides toward extinction. In 2001, white abalone became the first marine invertebrate listed under the Endangered Species Act. The mollusk was once abundant off the coasts of Baja and Southern California, thriving in waters 15 to 200 feet deep. “The continuing decline 30 years after the last major commercial harvest demonstrates that the strategy of benign neglect, or allowing the population to recover without intervention, has clearly failed,” the research study said. A poisonous spider is aggressively colonizing Southern California. Now, take a deep breath: The spread of brown widows could actually be good thing. Newly released research suggests nonnative brown widows are pushing out more dangerous (and native) western black widows. Most of the time, brown widows have a bite similar to that of common household spiders, producing only a red mark and slight pain, according to the Center for Invasive Species Research at UC Riverside. “The most common thing, anecdotally, that homeowners are saying is, ‘I used to have 3 or 4 black widows and now I have 10 to 15 brown widows,’” said Richard Vetter, a retired researcher at UC Riverside and lead author of a recent study about the interaction between the arachnids. 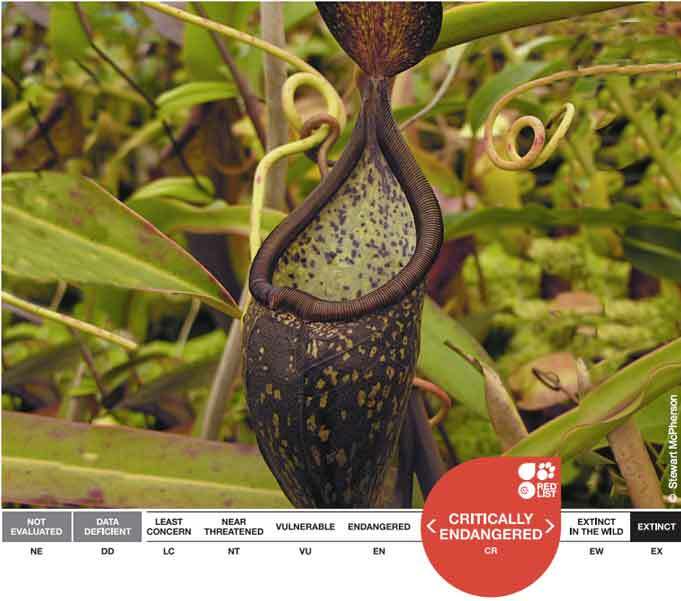 Nepenthes rigidifolia is not yet listed on the IUCN Red List of Threatened Species, however a provisional evaluation classes this species as ‘Critically Endangered’. Known only from a single location in Sumatra, Indonesia, this spectacular carnivorous pitcher plant produces mottled brown and yellowish green pitchers up to 21 cm tall and 8 cm wide, borne from unique, rigid leaves from which it receives its name. The traps of this plant are home to a wide range of dependant animals, including mosquito larvae and other arthropods. Only 24 specimens of this ultra-rare plant species were ever discovered in the wild, all outside of national parks and nature reserves. Unfortunately, that small number has been decimated by poaching and habitat destruction, and a recent survey confirmed just two individuals surviving in the wild today. To safeguard against complete extinction, multiple strains of Nepenthes rigidifolia are preserved through an ex-situ conservation strategy (i.e., conservation outside their natural habitat), with the hope that protection and restoration of its habitat may save this critically rare species, and the ecosystem of miniature life that it supports. For decades now, scientists at the NOAA have been tracking a mysterious whale song that sounds like the ghostly howls of a drowned tuba player. The sounds have been identified as belonging to a single whale, who sings at a frequency unlike any other whale in the world. Dubbed “52 Hertz” after the frequency range in which he typically sings, the animal has been called the loneliest whale in the world, since his love songs seem destined to go unanswered. Most other species of baleen whale, such as blue whales and humpbacks, sing at frequencies much lower, between the 15-25 Hertz range. Not only does 52 Hertz sing at a much higher frequency, but his calls are also shorter and more frequent than those of other whales. It’s as if he speaks his own language– a language of one. Even stranger, 52 Hertz does not follow the known migration route of any extant baleen whale species. He sings alone and travels alone. Could this individual be the last of a previously unknown species of baleen whale? That’s one possibility. Whale biologists have also proposed that he could be malformed, or maybe a rare hybrid– perhaps a blue whale and fin whale cross. Whatever the explanation, 52 Hertz is one of a kind. If you’ve ever wondered what type of tree was nearby but didn’t have a guide book, a new smartphone app allows users with no formal training to satisfy their curiosity and contribute to science at the same time. Scientists have developed the first mobile app to identify plants by simply photographing a leaf. 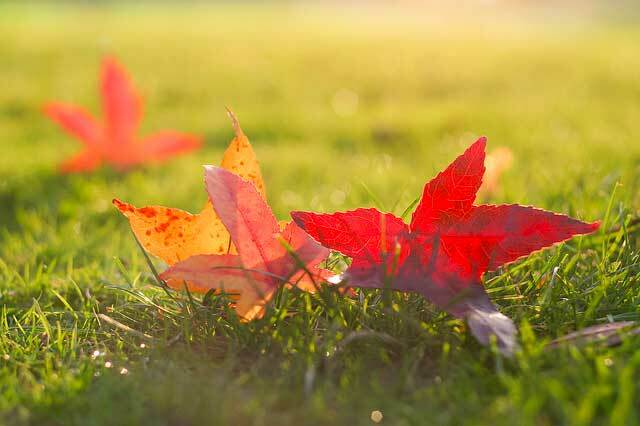 The free iPhone and iPad app, called Leafsnap, instantly searches a growing library of leaf images amassed by the Smithsonian Institution. In seconds, it returns a likely species name, high-resolution photographs and information on the tree’s flowers, fruit, seeds and bark. Users make the final identification and share their findings with the app’s growing database to help map the population of trees one mobile phone at a time. Looking for something fun, free, and fantastic to do with family and friends? Head out to America’s national parks where millions of stars light up the dark night sky, deer and antelope (and a few other critters!) play on the wide open range, and history is an unbelievable experience, not an exam. And the best news? During National Park Week, April 21-29, All 397 of your national parks offer free admission, all week long! Feel like breaking a world record? Join the Nature Conservancy in their giant Picnic for the Planet sandwich-munching extravaganza. The goal is to set a record for the largest picnic celebration ever. The picnic sites are dotted across the country. To mark the Clean Water Act’s 40th anniversary, the Wyland Foundation has invited cities across the nation — broken into groups by population — to compete at collecting pledges by individuals to cut down on water and energy use in the month of April. The World Wildlife Fund is inviting people to create their own Web pages to spotlight a favorite endangered species or cause by using W.W.F.’s easy-to-navigate software. A slideshow showcasing potentially transformative energy technologies from the 3rd annual ARPA-E summit. A slideshow, in observance of Earth Day 2012, that helps consumers move well beyond the throw-it-out mentality. Two apps that feature national parks have arrived just in time for Earth Day. And they’re free, which goes nicely with the Saturday start of fee-free National Park Week. So download the app, pick a park to visit and go. April 22 will mark Earth Day worldwide, an event now in its 42nd year and observed in 175 countries. The original grass-roots environmental action helped spur the Clean Water Act and Clean Air Act in the United States. Gathered here are images of our planet’s environment, efforts to utilize renewable alternative sources of energy, and the effects of different forms of pollution. 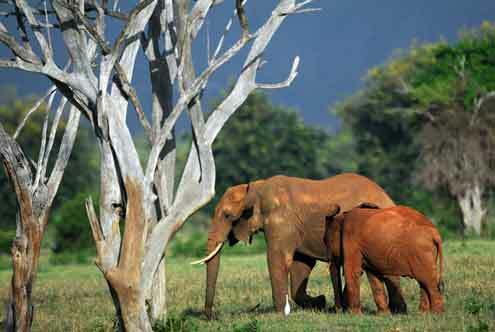 Elephants forage on March 20, 2012 in the Tsavo-east National Park. The holiday is Earth Day — the 43rd to be held since Gaylord Nelson, then a Democratic senator from Wisconsin, proposed that a “national teach-in” on the environment be held on April 22, 1970. Did you know that there are 22 sensitive and endangered species that rely on the Bolsa Chica Wetlands in Huntington Beach, California? As of January 2011, that list includes 16 bird, 1 reptile, and 5 plant species. The full list below doesn’t include the 200+ other birds that call the wetlands home, but it does give you a sense of how important this place is.